One year ago today we hosted our very first workshop entitled Portfolios and Perspectives!!! This day was such a special one where it brought together my love for photography and event design!!! 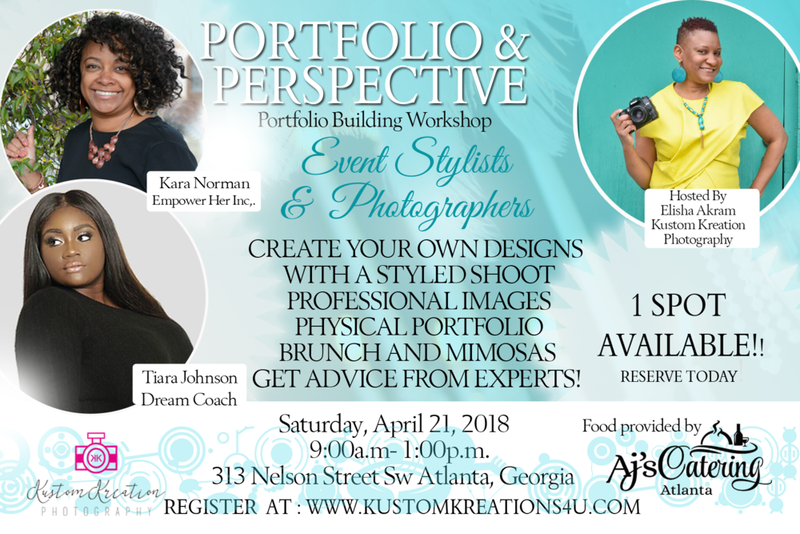 AJs Catering Atlanta, GA provided the delicious delights and dynamic speakers Vanessa Parker The PinkBoss Helena Paschal Correlations, LLC-Event Training provided the attendees with solid information to build their businesses... and Me!! All I could do is smile from ear to ear.... When you see a vision come to life and everything came together!!!! Thankful for all the participates and staff!!!! More to Come! Let's build Together! 40th Birthday Celebration in the Garden ! You've heard of a vegatable garden, a flower garden and even a secret garden. So with all that in mind earlier this year we were contacted by Ronda, she was putting together her birthday celebration and she decided to have an intimate dinner with friends in her private home. The theme of the dinner party was Garden. Friends How many of us have them? Well for Ronda, she has quite a few that joined her for a private chef table experience. It was a milestone birthday and she decided to celebrate with her closest friends over some delicious dinner paired up with the best-tasting wine for the entree. We were so happy to be apart of the beautiful celebration and we totally appreciate being able to take a delicious plate home. A very welcoming table scape with customize menus fresh flowers and paired dinner wines for the meal. Appetizers and drinks were served as the guest awaited the time to be seated for dinner. Check out the private Chef Aleem in action to learn more about the chef and his services click here! Great night with close friends over delicious dinner and wine. Happy Birthday Dear Ronda! This smile says it all as they closed out the night with the famous birthday song by friends. One two buckle my shoe three four feet flat on the floor.... kiddie theme rhymes takes me back to times in the past when it seems like everything was so simple. That brings me to this classic birthday celebration. Hop Scotch & Jacks Tournament! We were thrilled to captured moments of Christina's 9th Birthday Celebration. This unplugged celebration engaged the attendees in classic games. They played Hop Scotch, Bingo Toss, Tic Tac Toe and we even played Hangman. Below is a few video highlights of celebration!